Previous post: If it doesn’t open… it’s not your door. Next post: Japan 2017 Diary: Picking up our pocket wifi at Narita airport. 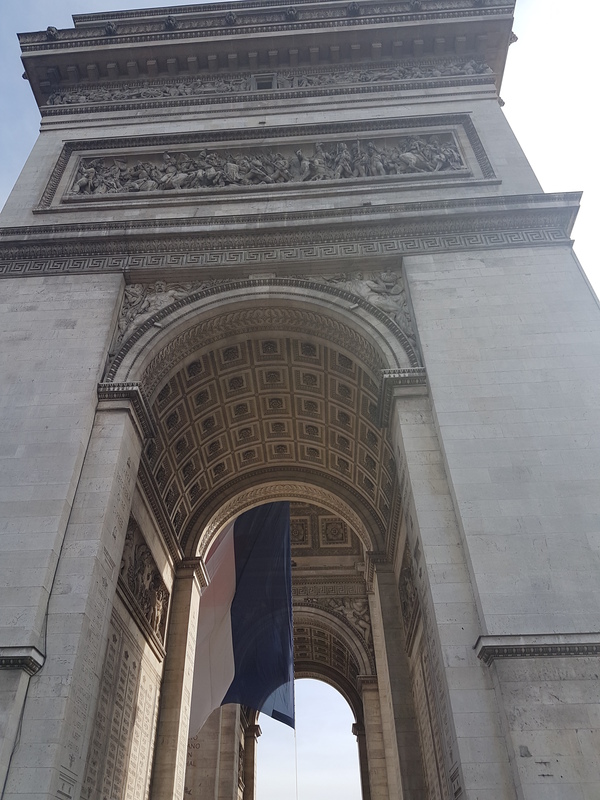 After spending some time admiring the Eiffel Tower, we then moved on to see another famous structure in Paris — the Arc de Triomphe. It was a 30-minute walk from the tower to the arch and we needed a little break from all the walking we had done since the morning, so we opted to ride an Uber instead — the fare wasn’t too bad and it was a very convenient way to get to where we wanted. 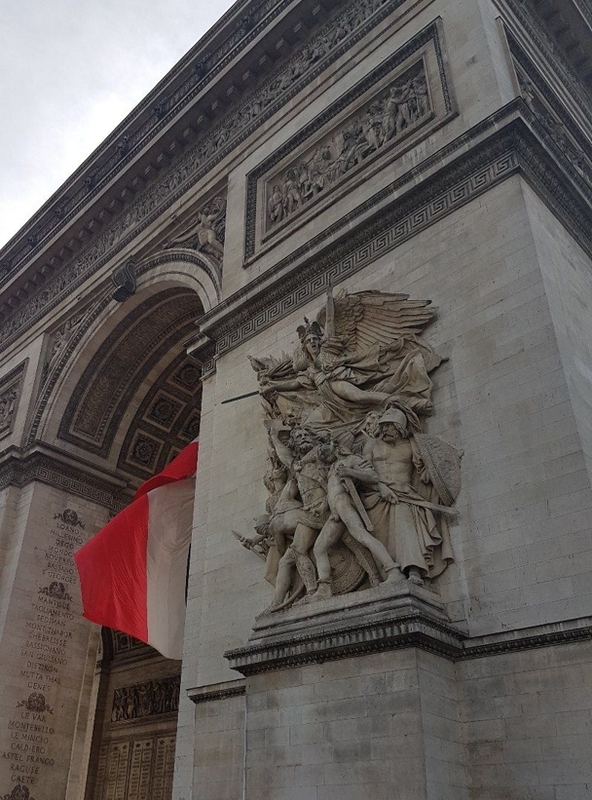 We got dropped off by the driver right at the side of the arch, but for those walking to the monument it is said that there is an underground tunnel on the Avenue de la Grande Armee side of the roundabout/circle (where the monument stands central). This tunnel can be accessed from the Wagram exit of the Metro. There was a short barricade surrounding the monument and a queue of people waiting to get inside. The fee to get in is 8€ for adults, 5€ for students and free admission for kids and teens below 17. Like the Eiffel Tower earlier, we opted not to line up and were content to remain on the outside of the barrier. 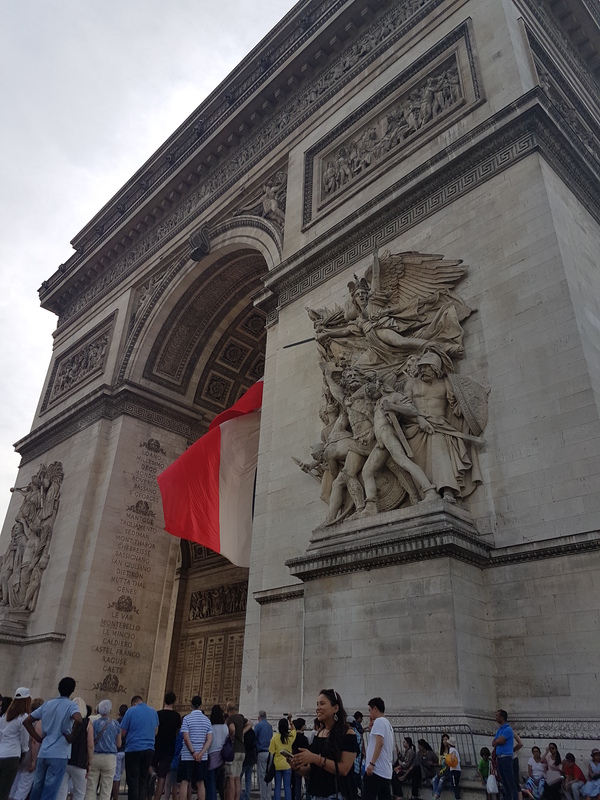 Then, after spending a bit of time gazing at the arch and taking some photos, we decided to leave and head off to Champs Élysées — Paris’ famous avenue lined with restaurants, shops and bars which was just across to where we were. I cannot remember how we managed to cross the busy roundabout/circle… but somehow we did! When we got to the other side, we took some more photos of the arch at a distance and while doing so we observed that there were people who were standing (and taking photos) in the median strip of one of the pedestrian crossings of the avenue which was in front of the arch. We decided to try it out as well to see if we could get some decent photos with the arch as our background. It was a bit scary at first standing in the middle of the street with cars going past to our left and right! But there were other people with us and the cars kept a bit of a safe distance so we were able to get our photos without any untoward accident and crossed back to Champs Élysées all in one piece! Great pictures. Happy to find some non -Eiffel pictures…otherwise all you get to is seine river and Eiffel on Paris post!